From literature and art, we know the myth of the lone genius who achieves maximum performance when working alone. Design, on the other hand, is a discipline in which teamwork stands behind success stories. And, in the history of design, particularly creative collaborations were accomplished where the knot was tied for life, not only professionally, but also personally. Our array of designer couples needs to be opened with Charles and Ray Eames – two of the most influential designers of all time. Charles and Ray, who was an educated paintress, met in 1940, at the Cranbrook Academy of Art. Charles held a teaching position in Design, and Ray was a student. They were married a year later, and shared nearly 40 years of an unusually productive relationship, resulting in designs which are now regarded as all-time design classics. Legendary are the chairs made of moulded plywood and fibreglass, like the Lounge Chair (1956), or the Fiberglass Chair (1950), the first industrially manufactured plastic chair. The quality of their material innovations came, not in the least, from an unusual order for the U.S. military, which the Eames couple took over during the Second World War: they developed aircraft parts, leg splints and stretchers made of plywood, and also learned the technique of bending plywood under steam. During their following careers, Ray and Charles Eames stayed interested in industrial mass production, in order to offer both form and function to affordable prices. With the Aluminium Chair (1958) – which was made in an aluminium casting process – they created a chair that, up to this day can be found in manager offices in arts, politics and economy. Although the Eames couple wanted to make good and inexpensive designs, today, the prices for their design classics is rather high. Apart from a few exceptions, it is impossible to separate the life's work of Charles and Ray Eames’ creations, because, together, they both brought ideas to perfection. Most, however anticipate that Ray handled the artistic side, while Charles rather managed technical aspects of their working relationship. Another relationship in which design was certainly a recurring theme at the breakfast table, is the relationship between Anna Castelli Ferrieri and Giulio Castelli. As an art director and a co-founder of the Italian furniture manufacturer Kartell, they greatly influenced the Italian design scene (although, at first, the couple went separate ways in their professional life). In 1946, Anna Castelli Ferrieri founded her own architecture firm in Milan, and maintained contact with Le Corbusier and Franco Albini, while Giulio Castelli was a trained chemist who explored the properties of plastic with the Nobel Prize-winner Giulio Natta. Shortly after graduating, Giulio Castelli founded the company Kartell – now considered to be a pioneering company in the field of plastic furniture production. The couple’s professional paths united in 1966, when Anna designed the Kartell building in Binasco and became a design consultant and then an art director at Kartell. Until the late eighties, the couple worked side by side at Kartell, and revolutionized the design aesthetics over and over again with humorous, colourful and functionalistic plastic objects. Aalto is another big name in modern interior design and architecture. 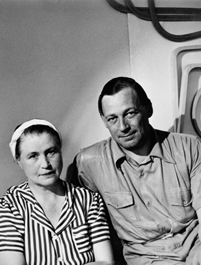 However, only few people know that not only Alvar Aalto, but also his wife, Aino, earned a living in design. In 1924, Aino joined Alvar Aalto's architecture firm. The two fell in love, got married, starting their lifelong partnership. From a professional point of view, this union was not always without competition: in 1932, Alvar Aalto was beaten by his wife in a design competition. The winning entry, the "Aino Aalto" glass series, was the first glass designer product which was designed for everyday use and could be produced with modern production methods. 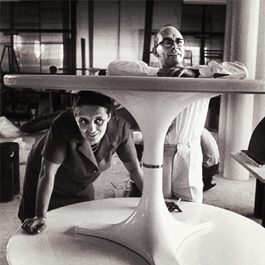 But, similar to the Eames couple, it was common for Aino and Alvar to work together on designs for furniture and fixtures. With their uncompromising functionalism and timeless design with humanistic signs, Aino and Alvar Aalto have beautified the daily lives of many people, and not only in Finland.